Indeed, she was pregnant, and looking for a safe haven to nest and have her babies. By the middle of January, staff were getting concerned about where Mamacat would have her kittens. Things were slow enough to book one guest room for a few weeks. “She checked in right away. On the morning of Friday January 19th she began to call us for her delivery”, says Camille. “If we tried to leave, she would follow. So we stayed and took turns all day...until she delivered five perfect kittens.” These days, Mamacat lives a much more relaxed life. Her kitten rearing days are over, and she lives on poolside as purrmanent resident cat. Mamacat and photos of her beautiful babies feature in our new Magazine. Read her full story there, and find 17 other Hotels With Cats, art, recipes, fashion, travel advice and more! Kembali Lagi Guesthouse is one of the top properties in Sanur, winning numerous TripAdvisor awards. The guesthouse consists of eight beautiful and uniquely decorated rooms, from standard rooms to a family suite, which all surround a pool. More recently, they have opened a stand alone four-bedroom villa, Villa Indah Lagi, available for groups of travellers. Kembali Lagi Guesthouse is located at Jl. Kesari No.36, Sanur, Denpasar Sel., Kota Denpasar, Bali 80228, Indonesia. Basic rooms start at $44 USD per night. Book direct via their website for the best rates. Going to Bali? 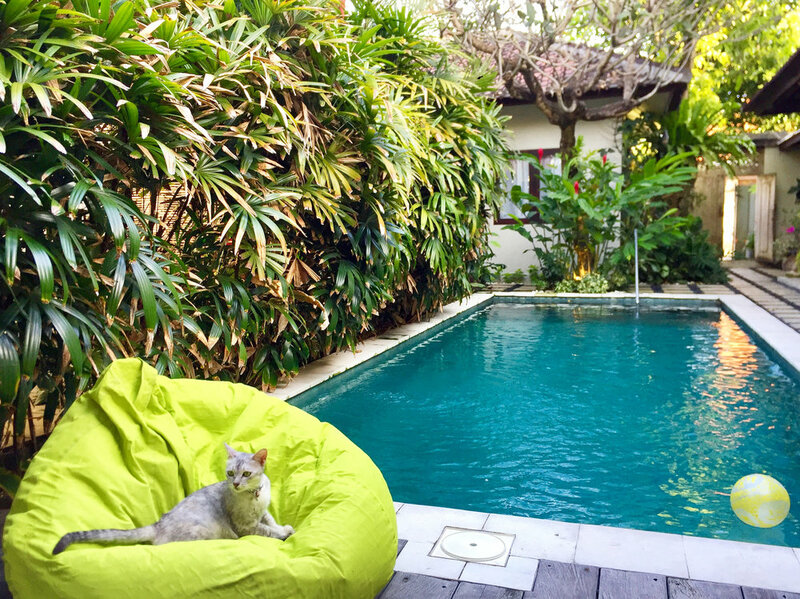 Why not pair your visit with a day or two volunteering at Villa Kitty Bali! Hotels With Cats is the world's first travel directory for cat lovers! We help you find cats wherever you are while showing the world that kindness to cats is good for business. Did you know we recently launched our annual magazine full of 54 pages of cat travel goodness! Our magazine is packed with art, fashion, city guides and features on sanctuaries, cafes and shop cats that you can only find in our print publication! Check it out here. Share away by using the icons below. Our 54 page limited edition bespoke magazine for cat people is now available. Our magazine features 18 stories of kindness to cats from hotels across the world. Find out how The Algonquin in New York City has had a resident rescue since the 1920’s, how Mamacat in Bali was given a guest room to have her kittens in and now lives on as resident cat and how Madonna, our cover model was wandering the streets of Amsterdam until she found her forever home.